You can perform off-line grading and import grades into the Grade Centre. You can also upload grades from external sources such as an Excel spreadsheet or a comma-separated values (CSV) file. You must format data specifically to upload correctly and to synchronize with existing Grade Centre data. the easiest way to do this is to download a pre-formatted file from the Grade centre (see below). Below this is a simplified example of the most common use case of off-line marking and batch grades/feedback uploading. Browse to the Grade Centre using the Full Grade Centre view. 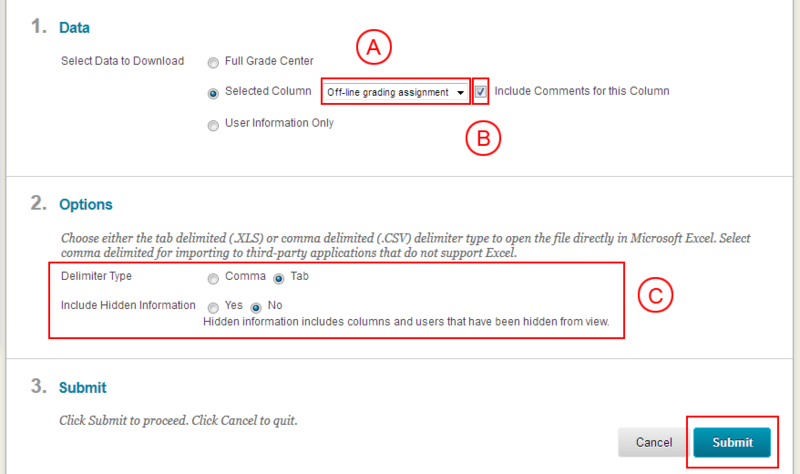 IMPORTANT If you do not use this view and use a smart view or either of the pre-set Assignments or Tests views you will not be able to select a specific column to download in step 4. Notice in this example that 3 of the 6 students have submitted as denoted by the Needs Marking icon displayed in the relevant column. Roll over Work Offline and select Download. A – Select the Relevant column form the drop-down list. B – Tick Include Comments if you wish to upload feedback as well as the grade. C – Leave these options as default. Click Download and save the file when prompted. Open the file that you have just downloaded in Excel. You may see the warning below. Click OK.
Once loaded the file should look something like this. You may see some other Totals Columns. Columns A-E identify the student and when they last logged in. Column F shows the grade data. In this case, we see 3 entries of Needs Grading next to the students who have submitted, as we saw earlier in the Grade Centre. Students with no submission have a blank cell. Column G shows the comment that will be added to the Grading Notes. These are notes that are displayed to the Markers. Students will not see this text. Columns H and J show formatting information. IMPORTANT This SHOULD NOT be edited under any circumstance. Column I shows the comment that will be given as Feedback to the student about the assignment. Once you have added grades and comments you will have a file that looks something like this. IMPORTANT Select Save as from the File menu. DO NOT simply try to Save the document. It is very easy to alter the formatting by mistake, making the file incompatible with Blackboard Grade Centre. When saving the document you will need to name it and ensure that the format is Unicode Text. You may see the following warning. Select Yes. Return to the Grade Centre. Roll over Work Offline and select Upload. Select the file via Browse My Computer. Leave Delimiter marked as Auto. A confirmation screen is then displayed that shows that Grade Centre has understood the uploaded file. There will now be values present in the relevant column and row of the Grade Centre. Roll over any Grade Attempt and Open the context menu using the Downward Chevron. Select Quick comment. You will then see the Feedback that you uploaded.